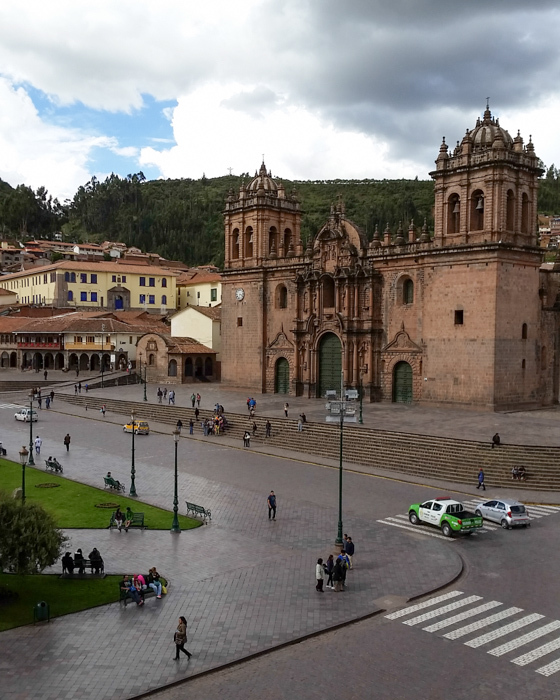 When we got back to Plaza de Armas we went right to the cathedral. When we showed our credentials verifying we were priests we were received with such deep respect and warmth. 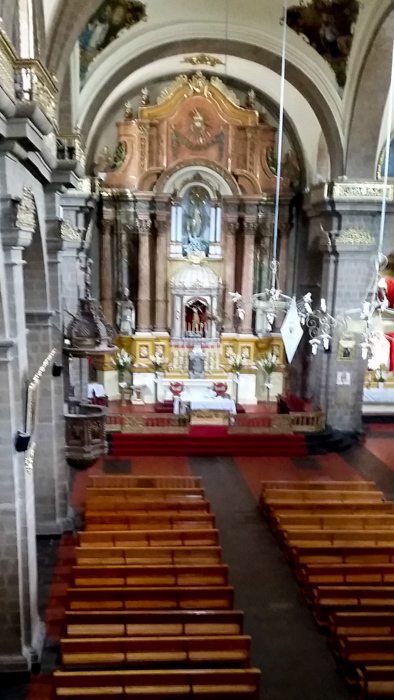 We were given an audio guide and discovered the extensive art of the cathedral complex that consists of three churches. There were altar retablos covered with mirrors. The art historian pointed out that mirrors were considered a sign of vanity in European art but in pre-Christian Incan art the mirror was considered as a sign of character. Only an honest person could look in a mirror. 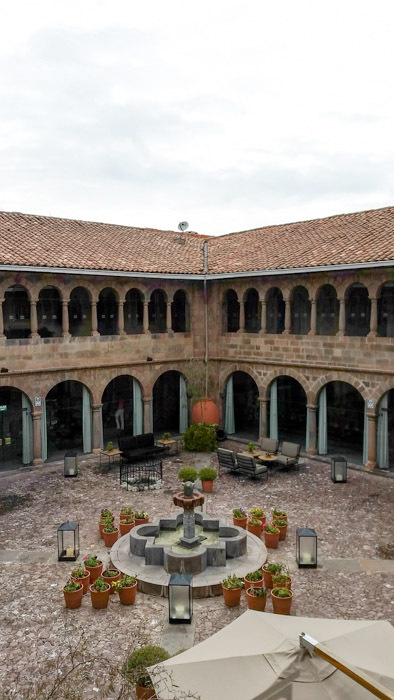 So when the Spanish opened up a studio under the direction of Bitti the Incans did not simply copy European art but transformed it into an American idiom. The art critics continued to stress the symbiosis of cultures. 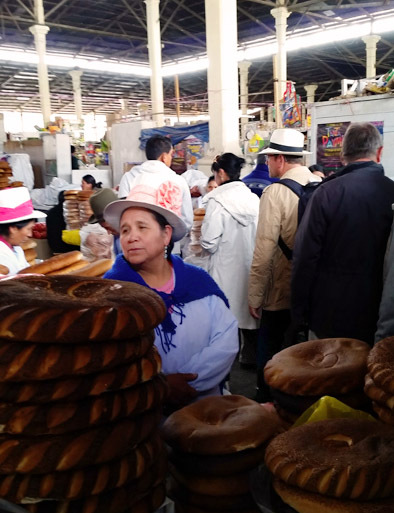 The guide continued to point out this transformation that the church encouraged in her mission to present the Gospel in a way the Native Americans could not only understand but see expressed in their cultural idiom. 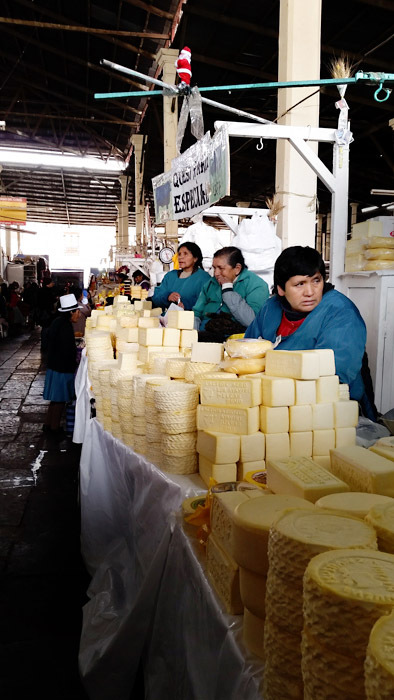 For example there are Madonnas everywhere in high carved altar retablos covered with gold but Mary does not look European but Incan. Her garment is triangular evoking the sacred mountain and Pacchu Mama that is the earth mother from whom life comes. Our Lady still appears with child although she holds Jesus. This again is a Native American motive to show Mary is the new Eve, the mother of those born again through faith in her son Jesus. In the cathedral there is a huge Last Supper and in the middle of the table is a plate with a guinea pig. This again is a pre-Christian symbol of the fellowship and joy that is part of a meal shared with friends. Once again we see a Native American incorporating his pre-Christian symbol system within a religious painting and bringing it new meaning. There was another Madonna presiding over the reconquest of Spain but there are llamas in the painting. The entire tour kept speaking of the American art that was an important part of evangelization. We then went to the Bishop’s home which still functions as his home and office however all the public rooms are a museum. 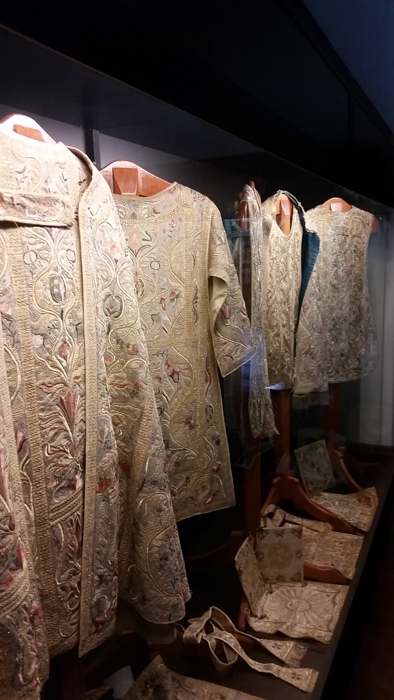 The guide pointed out how the Native American artists preferred the Flemish details they studied because of the beautiful cloth, so they developed their technique of gold filigree when gold was applied then worked into rich texture and there was a fondness of incorporating local flora and fauna. 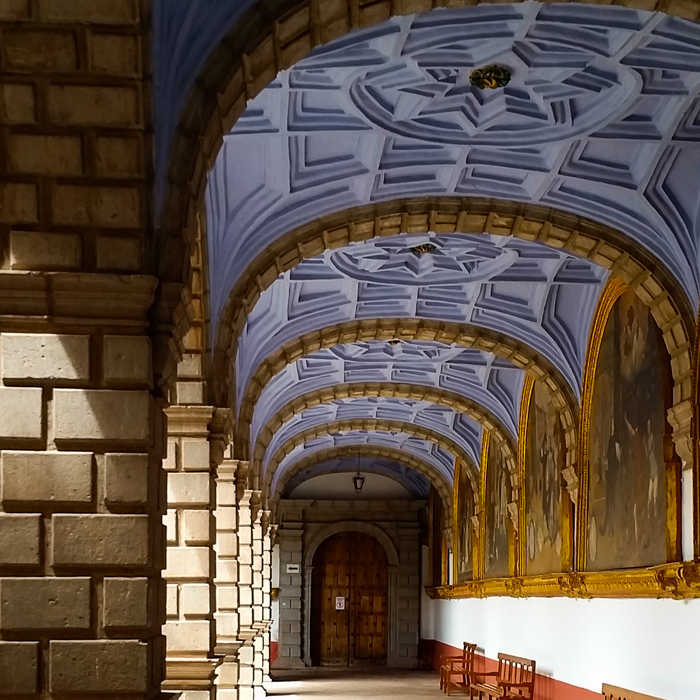 From the museum of religious art housed in the archbishop’s palace we went to the Jesuit church. We were given a great tour. Our guide spent some time talking about a large canvas that you see as you enter the church. In the center is saint Ignatius of Loyola who founded the Jesuit order. To his right is his brother and next to him his son standing next to his Incan princess bride. In the upper left hand corner stands the Incan king and queen with their daughter who will marry Saint Ignatius’ nephew. 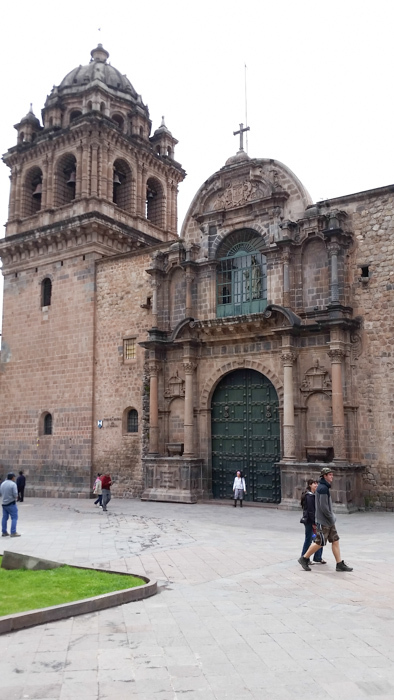 Then to the right we see the granddaughter of the Incan King who is the daughter of Saint Ignatius’ nephew being married in Spain into the highest and powerful Borgia family. 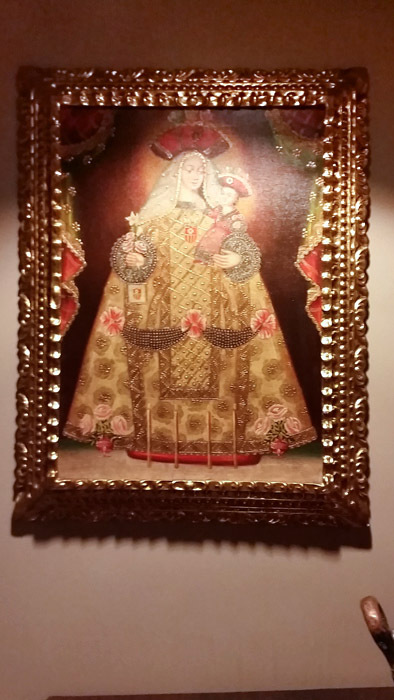 The guide said this painting had a political purpose, to show that the church saw the merging of the white European culture and the brown indigenous culture to be the future of a new culture. The painting is clear in its message. The nave is dominated by a huge golden altar retablo. 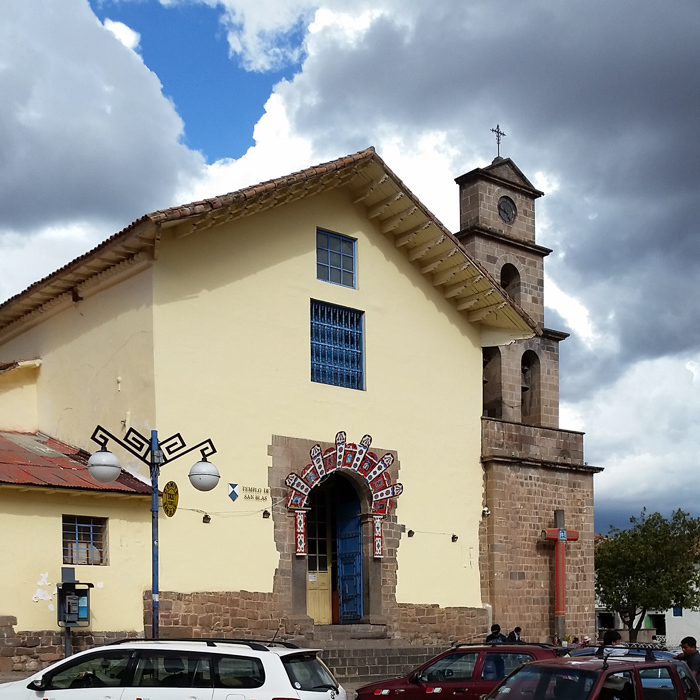 It is the most splendid church in Cusco. Then she took us to the crypt to show us the indigenous motifs in the frescoes over the altar . 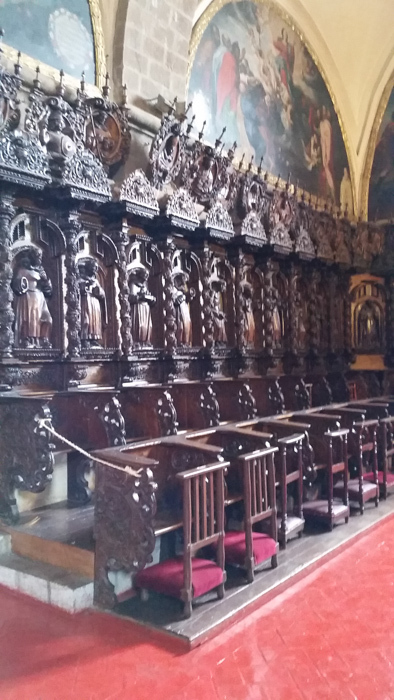 We concluded with a visit to Saint Blas in which is a pulpit designed and executed by an indigenous artist. This Native American has Henry the Eighth and Queen Elizabeth I in the flames of hell under the pulpit. 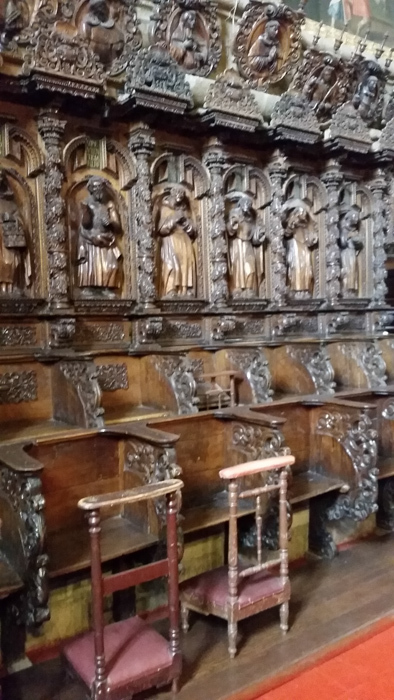 The pulpit is an enormous wooden carving celebrating the virtues triumphing over the vices through preaching. It is an explosion of Catholic doctrine mediated through the evangelists and doctors of the church. It is an incredible example of the skill of the Native Americans. This was a long day however I stood back with a greater appreciation of the exceptional synthesis of culture that was brought about in the colonial period. 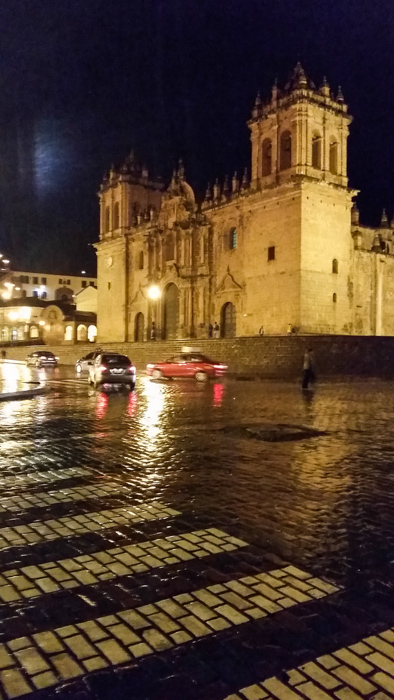 That evening I returned to the cathedral to enjoy one last look and say a prayer for the people of Peru. 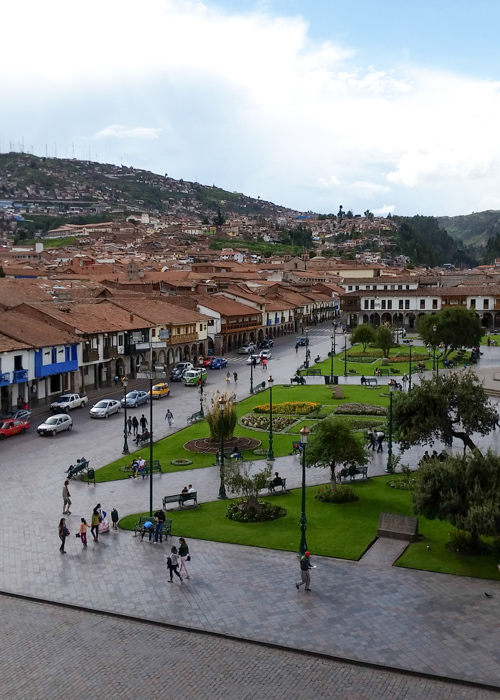 This entry was posted in Travel and tagged Angels, Cusco, Peru, Spain on February 5, 2015 by frjfkauffmann. 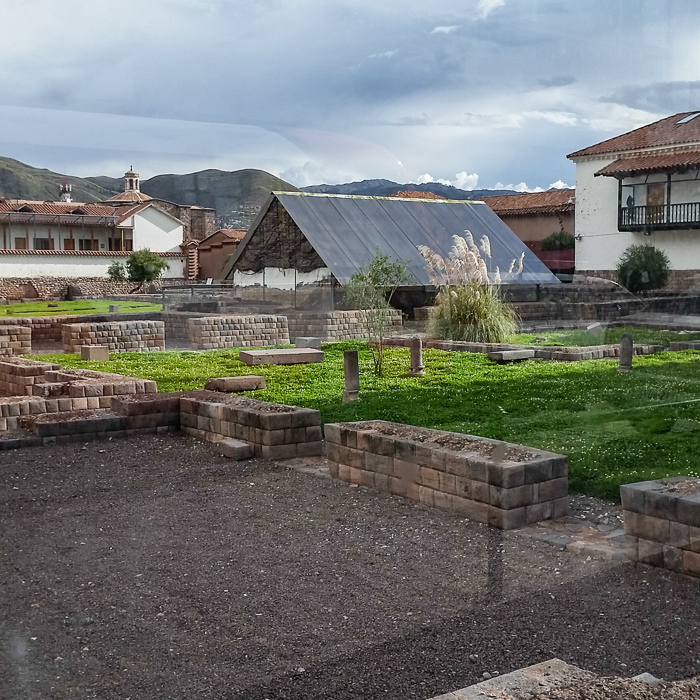 This first morning in Cusco began with a leisurely breakfast at a hotel that was built over the foundations of an Incan palace. In fact you can see the foundation from the street. The breakfast room overlooks a beautiful courtyard. 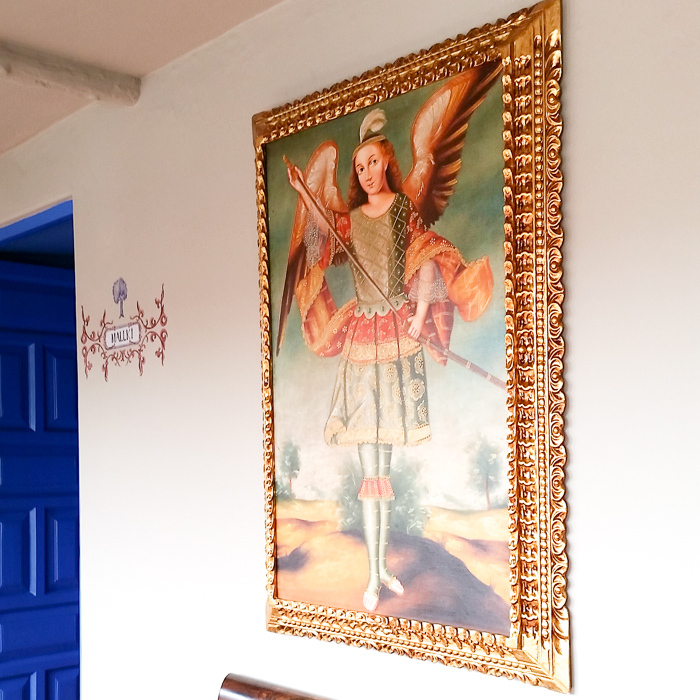 And the bonus is that the walls of the hotel are covered with Native American Catholic art called the Cusco school. This was wonderful because photography was not allowed in churches and museum so the photos I took of the hotel walls give a person a taste of this Native American art. 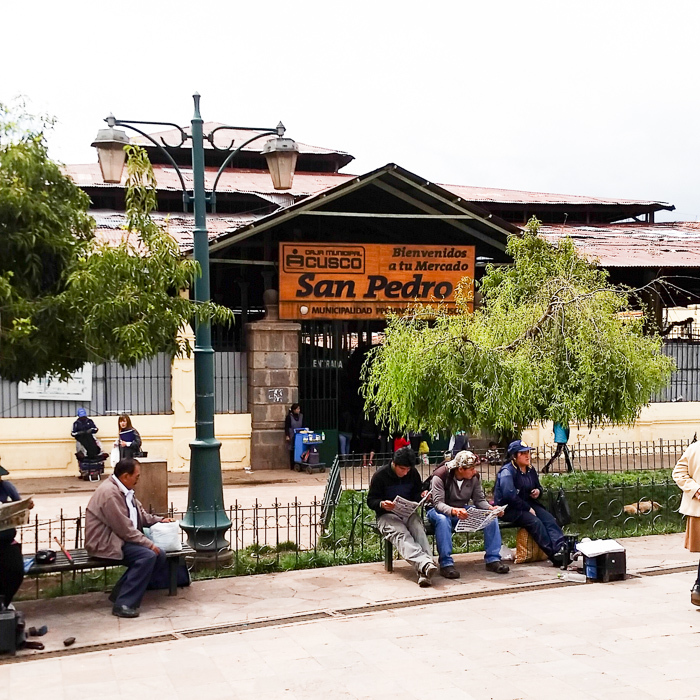 After breakfast we began our walk to the central square called Plaza de Armas which was constructed by the Spanish around the square that was central to the Incan empire. 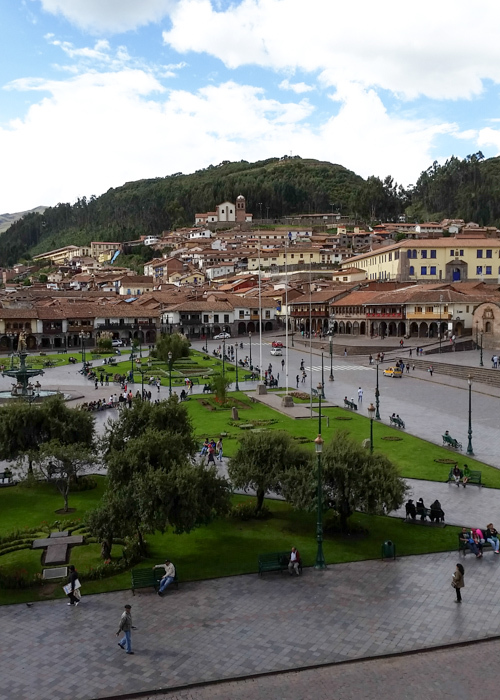 The cathedral was built over the palace of the Incan king and the cathedral dominates the square with an architectural bearing that is imposing indeed. 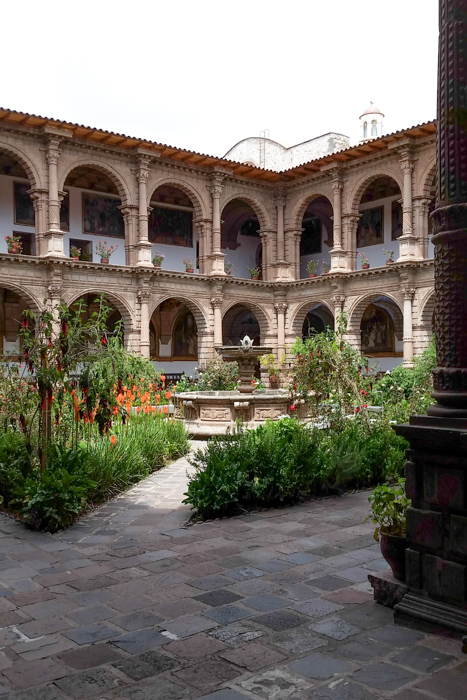 The cathedral houses a treasury of altar retablos and painting and carvings by the Incan artists. 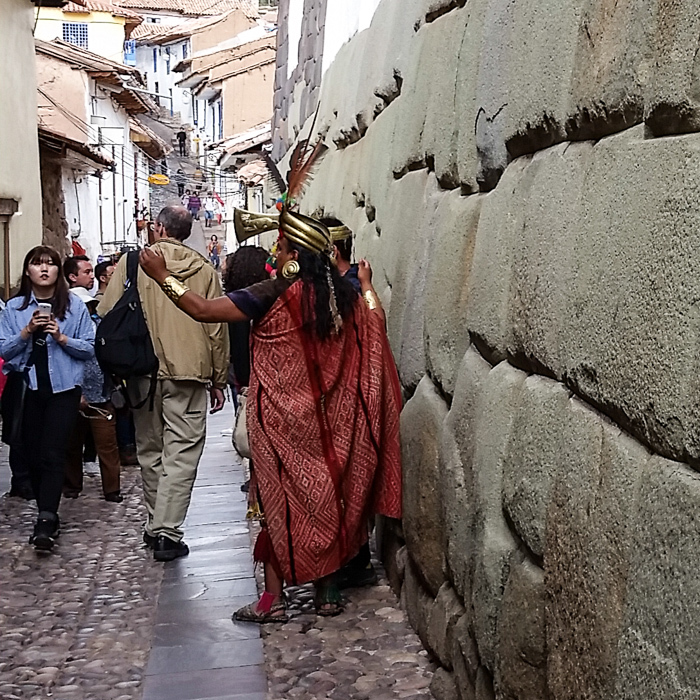 The artistic skill of the native Incan artisans was cultivated by the Spanish, who brought an Italian artist whose name was Bernardo Bitti who opened a studio for the Native Americans. They studied European art but were encouraged by the church to reinterpret European art with Native American motives to promote the Catholic faith. For example they studied Raphael’s Madonna with a Goldfinch but substitued a local bird familiar to the Incan people. The synthesis the church encouraged in the 16th century is inspiring in that they did not impose a European canon of art but let that tradition live in relation with a pre-existing culture to bring about a new tradition rooted in the artistry of the Native Americans. What an exceptional way to inculturate the gospel. In the pre-Christian Incan art angels loomed large so in the Incan Christian art angels took on that aspect with colorful wings. 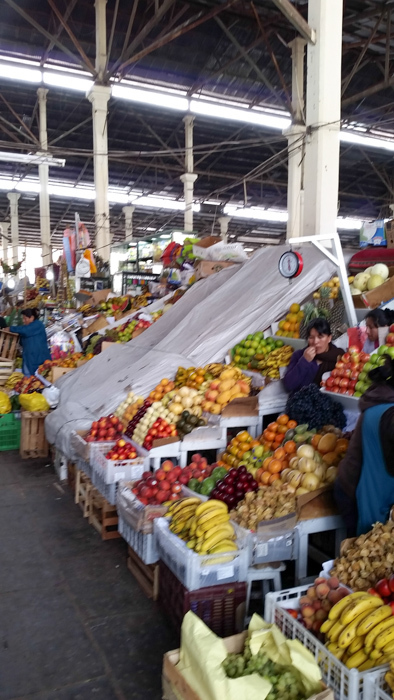 We then proceeded to Saint Peter church and spent the morning at a lively and colorful market. 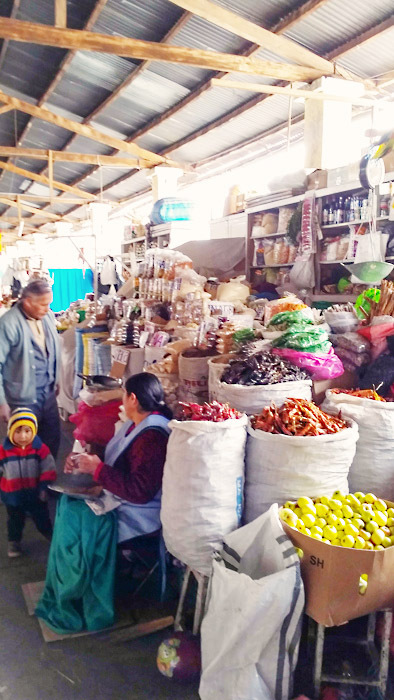 From there we went to La Merced. This church houses a fine collection of Native American Catholic art. Three pieces intrigued me. When I entered to my right I saw the largest seven silver candle sticks I had ever seen. It was a very costly work of silver and I thought to myself, “This is a menorah.” And it was! This was a gift of the local Jewish community in the 17th century to the Mercedarian order. 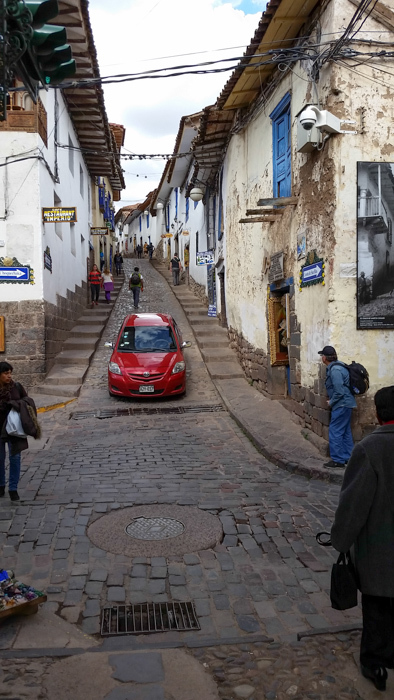 I was not aware of a weathly Jewish community in Cusco. Church of Mercy. Unusual baroque facade with columns with carefully wrapped grape leaves. 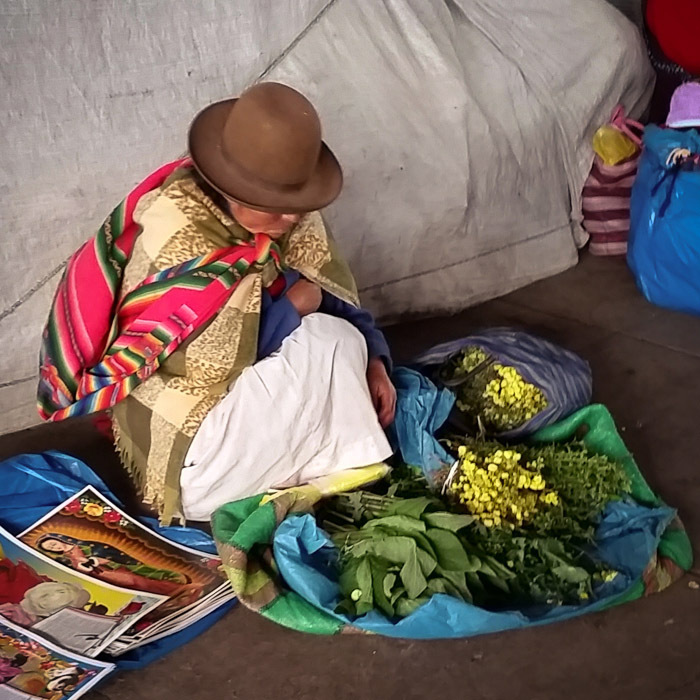 La Merced or the Church of Mercy contains one of the most priceless treasuries in the city. It houses a monstrance that is of solid gold and more than a meter high. The monstrance is encrusted with thousands of precious stones and has the second largest pearl in the world. This monstrance is called the Custodia. The choir. Le Merced belongs to the Mercedarian Order. One statue of a Pieta caught my eye. (Here is an image of it, from a user on Flickr). It was not large but perfectly proportioned. Our Lady looked like an Incan princess drapped in Incan cloth and Our Lord was in her arms in the same beautiful cloth with the headdress of an Incan warrior. Indeed he was a valiant warrior who confronted death and won victory through bravery and destroyed even the prince of death himself. I was overwhelmed by the skill of these Native American Indians. Leaving the church we decided to hop on a local open-air tour bus and take an hour tour around the city. 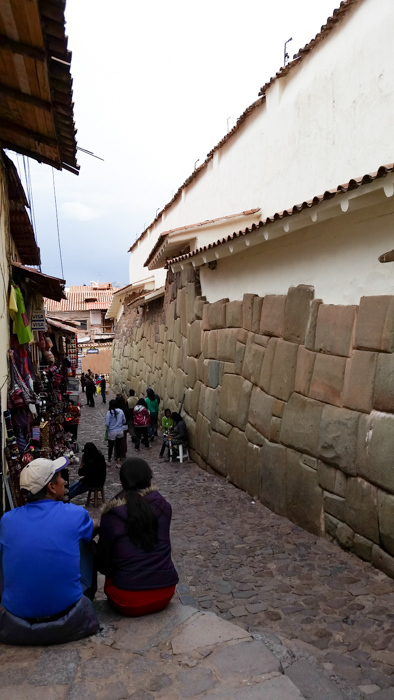 We saw more Incan ruins. 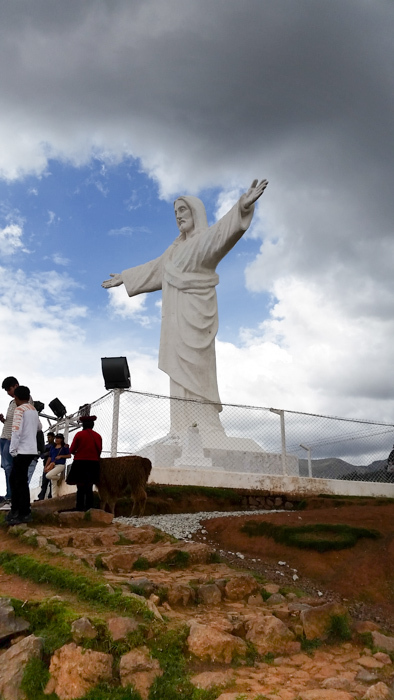 However most stunning was the statue of Christ with open arms dominating the city. 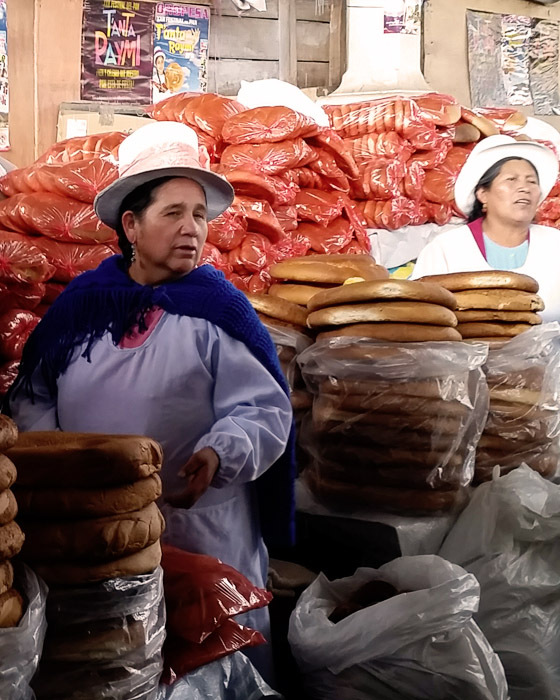 It was a gift of Palestinian Christians who were dispossessed of their homes after the war in 1948 and Peru opened her arms as Christ opens his arms to receive these Palestinians. The gift touched me very deeply in that it spoke of the gratitude of these Palestinian Christians who found a new home. The pre-Christian imagination was filled with angels so they took to angels and painted them with pre-Christian touches like colored wings. Another unique touch was that in European art it was forbidden by the church to paint the Trinity in a way that the three Persons bore the same facial appearance. 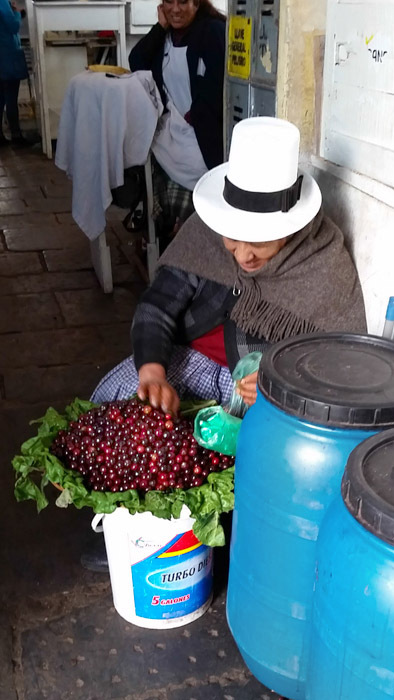 In order for the native Incans to understand the unity of three Persons in one, the canon was violated for the sake of evangelization. So the artistic rendering of the Trinity is unique. 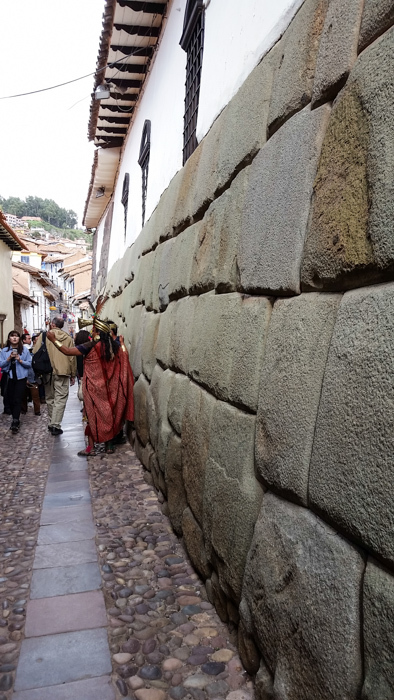 Corpus Christi has been a major moment in Cusco every since the early 16th century and continues to this day. 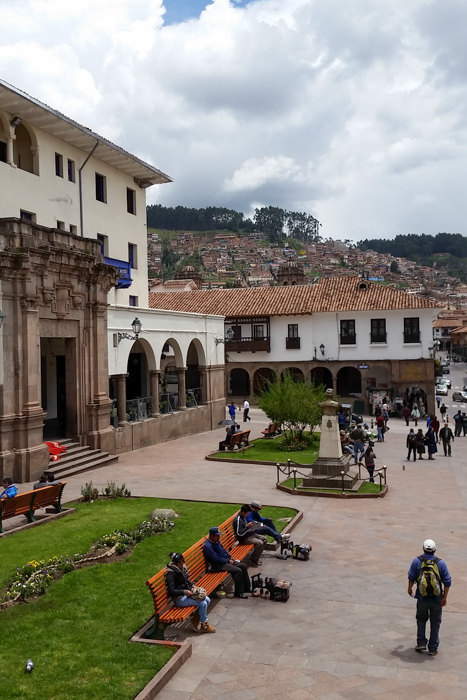 There were early canvases from the 16th century giving historical details of what the city looked like before the earthquake and the procession of Incan and Spanish nobility processing together. 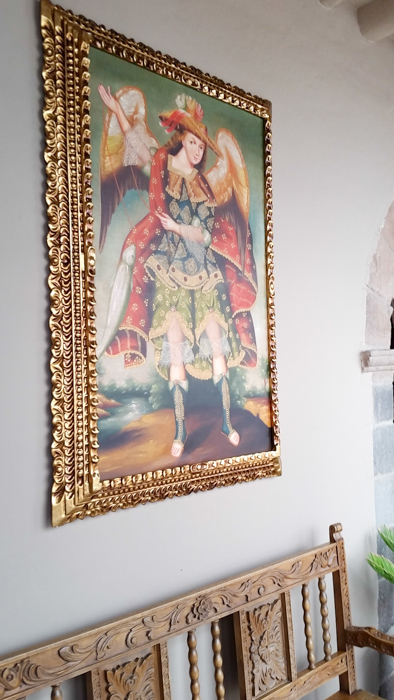 One canvas was given by an Incan benefactor so in the lower left hand corner is an Incan of noble standing with her grandson dressed in Spanish armor. 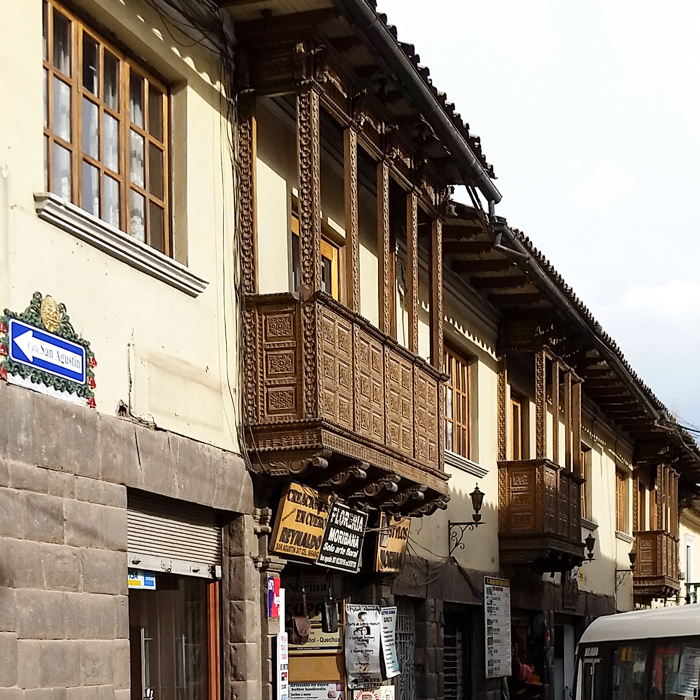 The Incan nobility were also patrons of the arts. The bishop made a comment about the chapel where his staff has Mass every Monday which is filled with filigree’d Madonnas. He spoke about the genius of this symbiosis of cultures. And the chapel had the oldest organ in America that was brought from Italy. 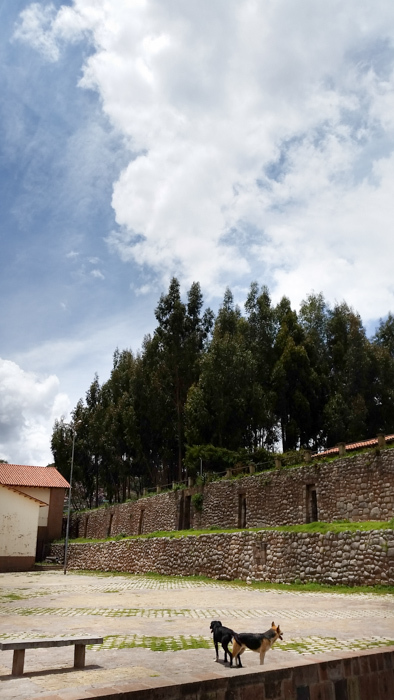 The museum was built on the foundations of Incan buildings and those stones can still be seen. I walked away so filled with wonder and in awe of the artistic genius and skill of these Native American artists. 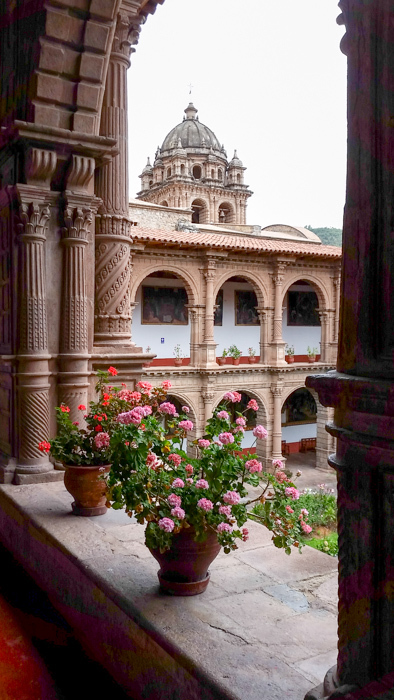 This entry was posted in Travel and tagged Angels, art, Cusco, Peru, Spanish on February 4, 2015 by frjfkauffmann. 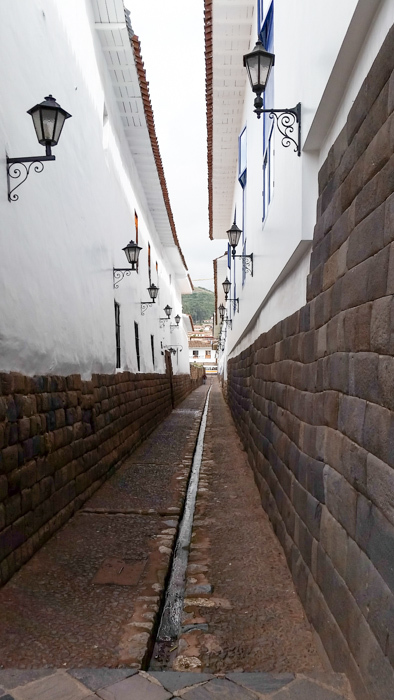 In this narrow street you can see the Inca walls of an ancient palace. 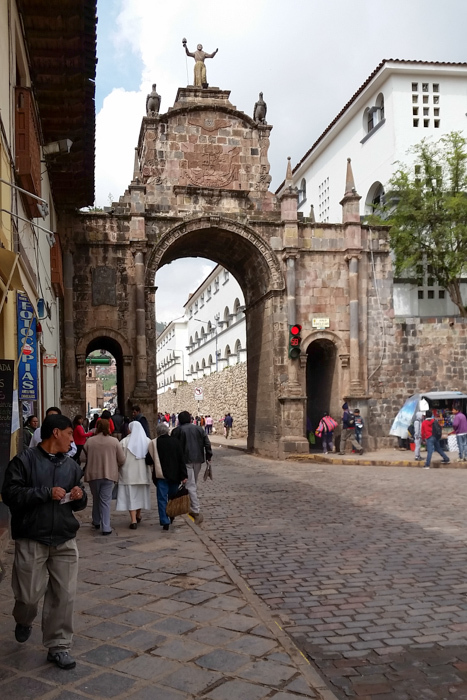 This entry was posted in Travel and tagged Cusco, Inca, Peru, ruins on February 3, 2015 by frjfkauffmann.